The Near East is situated at the crossroads between the genus Homo’s African evolutionary core and the Eurasian periphery (Fig. 1). 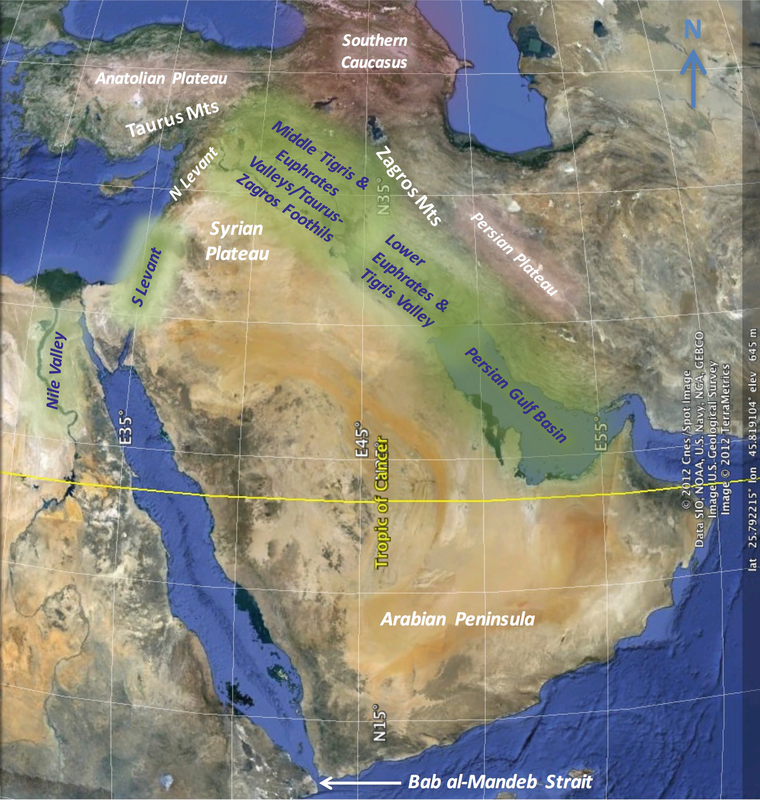 The Paleolithic and Neolithic prehistory of the Near East is literally central for understanding the genus Homo as a globally distributed lineage, whose single surviving species – Homo sapiens – continues to shape and be shaped by the terrestrial, omnivorous, extractive, and socially intensive niche with which it has coevolved. This essay examines the general theoretical issue of biocultural evolution in the context of Near Eastern geography, climate, ecology, and Stone Age prehistory. In doing so, it offers an overview of Paleolithic and Neolithic paleoanthropology and archaeology, with basic introductory information about industries, technocomplexes, fossils, and key sites in chronological context. Hershkovitz, I., O. Marder, A. Ayalon, et al. 2015. Levantine cranium from Manot Cave (Israel) foreshadows the first European modern humans. Nature advance online publication. Available on-line: http://www.nature.com/nature/journal/vaop/ncurrent/full/nature14134.html. Accessed 28 Jan 2015. Pagani, L., D. J. Lawson, E. Jagoda, et al. 2016. Genomic analyses inform on migration events during the peopling of Eurasia. Nature advance online publication. Available on-line: http://www.nature.com/nature/journal/vaop/ncurrent/full/nature19792.html. Accessed 4 Oct 2016.